Army Specialist Alberto Diaz joined the military in March of 2012 in Tampa, Florida because he wanted to provide a better life for his family. Being an excellent marksman who loved to serve his country, he quickly realized he had the skills to lead a successful military career. 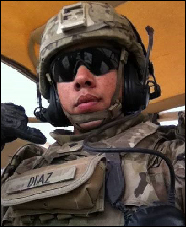 On August 2, 2014, while deployed in Afghanistan, Specialist Diaz and his squad were on high alert due to recent attacks. During their mission, the truck Specialist Diaz was riding in rolled over an Improvised Explosive Device (IED), triggering an echoing explosion. Unable to feel anything and losing blood, the blast caused Specialist Diaz to lose consciousness moments later. Specialist Diaz was sent to Walter Reed Medical Center in Bethesda, Maryland, where he began his grueling road to recovery. The IED blast caused severe injuries, including bleeding to Specialist Diaz’s brain and nerve damage to his entire face. He required complete right side facial reconstruction and also suffers from posttraumatic stress disorder, chronic fatigue syndrome, chronic pain, social anxiety, panic attacks, hearing loss and tremors. For his service to his country, Specialist Diaz has been awarded the Purple Heart, the Army Commendation Medal, the Combat Infantry Badge and the Afghanistan Campaign Medal. Specialist Diaz, his wife Kayla, and their son and daughter weregifted a mortgage-free home in Orange Park, Florida in 2016. Building Homes for Heroes® is strongly committed to rebuilding lives and supporting the brave men and women who were injured while serving the country during the time of the wars in Iraq or Afghanistan. The organization builds or modifies homes, and gifts them, mortgage-free, to veterans and their families. It’s our honor to support the men and women who have loyally and courageously served our country. © 2019 Building Homes For Heroes, All Rights Reserved.